I was told I was too young to see Star Wars when it premiered in 1977, but I was overjoyed when I discovered it was being re-released the following year. That announcement was conveyed to me through a magical image on the local theater marquee, a masterpiece of bright colors and bold lines, born from collaboration and error (the poster was actually done by two artists, and a miscommunication led to the original painting be done too small to fit all the necessary titles, so it was mounted to a larger board and the extended space was painted in with images of other “flyers” to create the now infamous “Circus Style” poster.) and to this day, I have a stronger memory of seeing that art for the first time than actually seeing the movie itself. Honestly, it is that way for most of my favorite movies. If the subject of Raiders of the Lost Ark comes up, before I even visualize Indiana Jones running from the boulder, or Toht’s melting face, my mind goes to a single image: Indy and Marion standing behind the glowing ark, with vignetted portraits of allies, foes, and snakes filling out the corners of an iconic movie poster. When I think of Back to the Future, the first thing that comes to mind is Marty McFly looking at his watch, his foot in the door of the Delorean, streaks of fire burning bright orange against the deep blue night sky. As a child, when I saw that one sheet image with no context as to what the movie was about, I had no idea what it meant. Except that I HAD to see that movie! Throughout my childhood (which includes up to right now, by the way) movie posters were such an important part of the entertainment experience. They offered a promise of the magic that was about to come, a hint to the worlds that lie behind the red velvet curtain. Whether it was kismet, or really good marketing teams, all of my favorite movies had the best posters. And as my appreciation for this art form matured, I soon realized that all of those posters were created by the same artist, Drew Struzan. You may not recognize that name, but you know the art. You may not even like the same kinds of movies I like, but I can guarantee Drew created the poster art for at least one of your favorite movies. He has done hundreds of them, and every one is as breath taking and awe inspiring as the next. His resume basically reads like a Hollywood hit list: Star Wars, E.T., Back to the Future, Indiana Jones, Harry Potter, Shawshank Redemption, Big Trouble in Little China, Hellboy, The Great Muppet Caper, Coming to America, The Thing, Batteries not included, Hocus Pocus, if you can think of a film with an iconic poster, Drew most likely illustrated it. So it is no surprise that I was completely taken aback this morning when Disney released the first image of the “official” Star Wars: The Force Awakens one sheet and it was a photoshop montage! After almost two years of publicizing how director JJ Abrams begged Drew to come out of retirement to do the poster, and then teasing us with the magnificent promotional art Drew created for the film at D23, I was shocked that I wasn’t looking at a hand painted masterpiece from the man himself. It was clear that whoever executed the final product definitely took their cues from Drew’s oeuvre, most likely in the form of endless comps the artist created to design his version of the poster. There is an attempt to recreate the daring color palette Drew is famous for, hints of bold outlines, some blown out highlights…but none of it rings true. For months, I have been hearing about people exclaiming that they cried when they saw the new trailer, or almost fainted when they saw a new character design in toy form. This time around, I haven’t let my guard down to get that emotionally connected yet. I want to see the movie first before I buy in 100%. I want to know who these characters are before I fill my shelf with 3 ¾” plastic effigies to them. The trailers have definitely shown me that John Boyega and Daisy Ridley have brought their A-game, but it was seeing Drew’s D23 promo art that really endeared me to them for the first time. It made me want to go on an adventure with them. Looking at that art allowed me to believe that “this is going to be great!” And it was for that reason today I actually did shed tears for The Force Awakens, sitting at my desk, staring at my lifeless computer at a soulless photo montage movie poster. Tears of utter disappointment. I was affected so deeply by the decision to use a photo comp poster over Drew’s art that I actually took the time to write this, and for those of you who know me or follow me, you know that I NEVER do anything like this. I have my opinions, as everybody does, but I don’t go plastering them all over the internet. But I felt like this had to be said. This isn’t about Star Wars, or Drew, or my childhood. This is about art, American culture, and Hollywood heritage. This is about tradition and integrity. I’m sure that whatever reasons where brought up in some big executive round table discussion about why it was valid to go with photoshop over a painting made perfect sense to those involved, but why? Why even discuss it in the first place? Why remove the human element out of such a human story? And if you are hell bent on going with photoshop, why not make it unique? Why try so hard to make it look like a Drew painting!?!? He was right there! I know hundreds of filmmakers who would give anything to have a Drew Struzan poster to accompany their film. I’m one of them! You had it and you threw it away? But only AFTER you showed us the possibility of how great Drew’s version would have been with the D23 art? It’s like serving filet mignon for an appetizer, and hot dogs for the main course. Like, 99¢ store deadstock hot dogs, not even Carney’s! 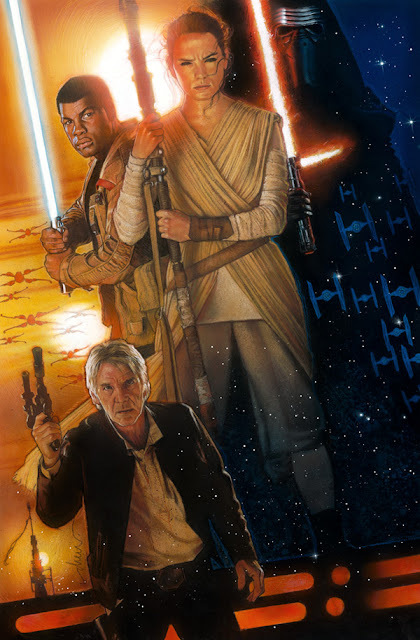 How does Disney not realize that a Drew Struzan poster is a staple of Star Wars? Not to mention the fact that they broke up a set. If there are truly going to be 9 main story Star Wars films, Drew painted 6 of those posters already. When Lucas asked Drew to create a new look for the Special Editions in 1996, the artist insightfully composed a triptych, and then even more cleverly continued the pattern for the prequels, so the whole series lines up like an adventure map. And now we are expected to just slap this computerized design, and those to follow, next to his organic freehand genius? I know I’m ranting now, but I just can’t see the logic. If Drew had remained in retirement, or “lost his touch”, I could see this happening, and there would be nothing we could do about it. . But he signed on, ready and willing, and proved to the world without a doubt that he still “had it” with the D23 teaser. I have seen all kinds of posts and comments today, and many of you are perfectly fine with the poster. Some of you even think it is “awesome”. All art is subject to opinion, and there is no right or wrong. At the end of the day, it is all about how the image makes you feel. I am just expressing that this images leaves me empty. And like a 30 year Star Wars junkie, I so badly needed a fix. I thought this poster would be it. I thought I would catch a glimpse of it and instantly know I HAD to see this movie. But instead I saw noise, a thin imitation, a backpedal on a promise, and my hopes and dreams were quickly replaced with fear and doubt for what other pitfalls this new film might have in store for me. The saddest part is that it seemed like JJ and all involved were trying so hard to respect the original trilogy, practical effects, design aesthetics, and the majesty of old world artistry. For this reason alone, and I may be in the minority here, but I feel that going with a photoshop poster is the most disrespectful thing of all. I know we live in the digital age, but we have to keep in mind that a computer is just a tool. I’m not saying its better or worse than a paintbrush, just that it has its applications and a time and place to use them. And this poster was not it. There are amazing digital artists out there, but Star Wars needs a poster illustrator, and Drew is the best. No computer can bring what he does to his art. The compassion, the spontaneity. The pencil on paper, the brush in the hand. The splatters, the random squiggles. You can study a Drew poster for decades and always find new surprises. He doesn’t paint movie stars, he paints characters. When I look at the new digital poster, I see Harrison Ford. When I look at Drew’s D23 art, I see Han Solo. Even for movies Drew didn’t like, he still loved doing the painting, and you can see that love in the art. You FEEL that love looking at it. If you don’t believe me, do me a favor and look at the new poster again. Really look at it. Let go of worrying about having tickets to the opening night midnight screening, forget about chasing your cat around with your awesome app controlled BB8. Imaging you know nothing about Star Wars, you haven’t been cyber stalking Lawrence Kasdan for hints to Kylo Ren’s backstory. Pretend you are walking past the old one screen theater in your hometown and you catch sight of it… Do you lock eyes with the characters? Are those spaceship leaping out at you? Do you feel the colors flowing over you? Are you mesmerized by the composition? Do you sense there is a greater story just beyond what you see? Does it look rich? Like a dream? Like no matter how long you stare you can’t figure out how it came to exist? Do you picture this poster in a very expensive hand carved frame with UV coated plexi hanging above your couch as you entertain guests 20 years from now? You may see it differently, but my answer to all of the above is NO. And for that I am very disappointed. Current marketing trends, with giant photos of actors, and heavily filtered images of objects forming logos, have made the once illustrious art of painted movie posters a breed on the verge of extinction. This art form has always been a part of this franchise, and in many ways Star Wars was the last great holdout for art of this kind. 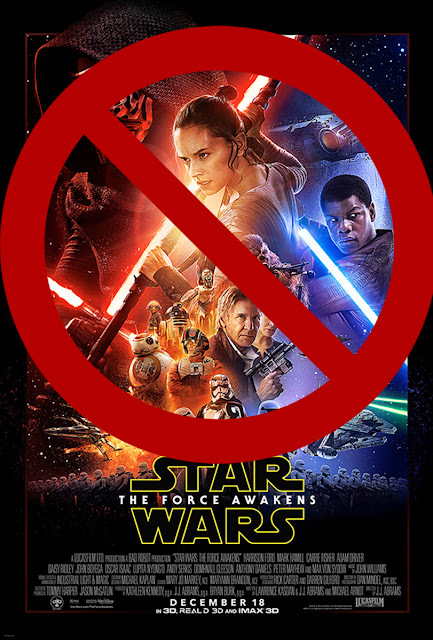 By not following in this tradition, Disney has shown me that they don't really understand or care about what Star Wars is at it's core, and have no concerns about letting such a vivid part of American pop culture die. I’m certain that the final art Drew meant us to see is crated away somewhere in the Disney vaults, like the ark at the end of Raiders. I believe that art is a horcrux, containing a piece of Drew’s soul. And a piece of my soul, as well as yours and all of us who make up the Star Wars universe. And until that art is out in the world, that universe can never be whole.